Oh my gosh, check out my new banner! Cuuuuute. My favourite is Mukmuk, if you couldn't tell. He's the little one at the end. I wish I'd thought of getting an Olympic banner earlier. I'd have gotten more time to use it. Anyhow, StBF (Sarah the Best Friend, for those new to the blog) made this. I lack the skillz. But she's also made a bunch of new banners for me to use for the rest of the year. So sweet. Anyhow, onto the polish. It'll be a quickie post today as everyone and their freaking neighbour's dog's vet has swatched this. 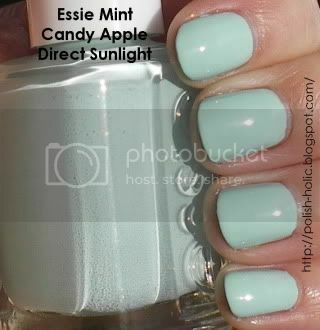 I would like to start off by saying Mint Candy Apple does not sound appetizing at all. Do they exist? Has anyone ever had one? Yes, anyhow, this is a bluey-green mint creme. In my opinion it seems much too blue to be a mint green. This is sooo not my thing. I've actually had these pictures for a while but I just didn't like it at all and didn't feel like posting it. But since I have it, I might as well put it out. This is two coats with top coat. The application is good. But it has a nice stiff brush so just be careful to not press down too hard. Yup, the mint trend is so not for me. It is going in a swap bye bye. Another note to add, I have updated the swatches for OPI She's Golden, so anyone who's interested, please go check that out. Well, um, this was not a quickie post. Lol. Oops. That banner is so cute! I love it! I feel a bit the same: it's not really for me. "Green Candy Apple" looks really better on my sister. Her skin is not prone to redness at all. On me that's an other story, my fingers get red when it's cold and I feel a bit like Dr. Zoidberg with a blueish mint on. I'll try it when it's less cold and figure out. Love the banner! So cute! I like this color, I'm super pale so the mint thing works for me. But, yeah, the whole Mint Candy Apple sounds disgusting...no need to ruin a delicious candy apple with mint! x.abigail: You know what's weird? I don't really do light colours on my toes. It's almost always dark colours. I don't know why that is. Lol. shekinaah: Thanks! And yes, it just looks weird, I think. Lisa Kate: Thanks! I love mint with all sorts of stuff, but definitely not a candy apple. UGH. Aww I love the banner! It makes me miss Canada so much! You're from Canada, or you've been? My dad is canadian, mum is from here. I spent lots of my childhood in Canada, mostly Ontario and Quebec areas. Oh! That's so awesome. You got to spend time on both sides of the border. i want that color so badly!!! !